Phosphorus being the structural component of Nucleic acids and it is essential for all Plants. Phosphorus plays a vital role in Photosynthesis, respiration and root development. Low level of Phosphorus within in plant causes stunted growth. 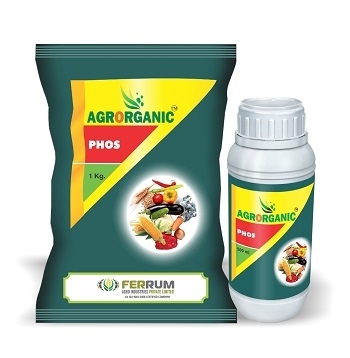 In order to address the phosphorus deficiency, Ferrum Agro Industries Private Limited has launched AGRORGANIC® PHOS, as readily available form of Phosphorus. AGRORGANIC® PHOS is a Protein Hydrolysate (Amino Acids) based plant nutrient having 20% Phosphorous (on DB). Amino acids act as carrier material which results in increased uptake of phosphorus by the plant. Recommendation: vegetables, fruits, cotton, Cereals, horticultural crop and all other crops. - Addresses the Phosphorus deficiency in all crops. - Enhances flowering and increases fruit and seed production. - Effective for the healthy crop production and higher yields. - Helps in Photosynthesis and respiration. - Completely biodegradable and improves soil health. - Compatible to be used along with other fertilizers/pesticides.